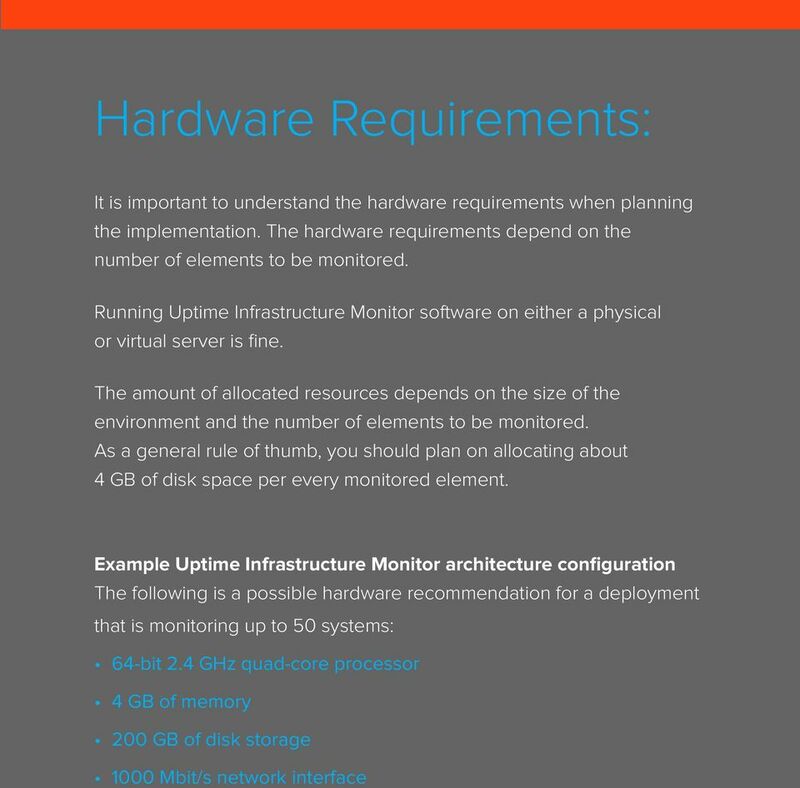 Download "Uptime Infrastructure Monitor. 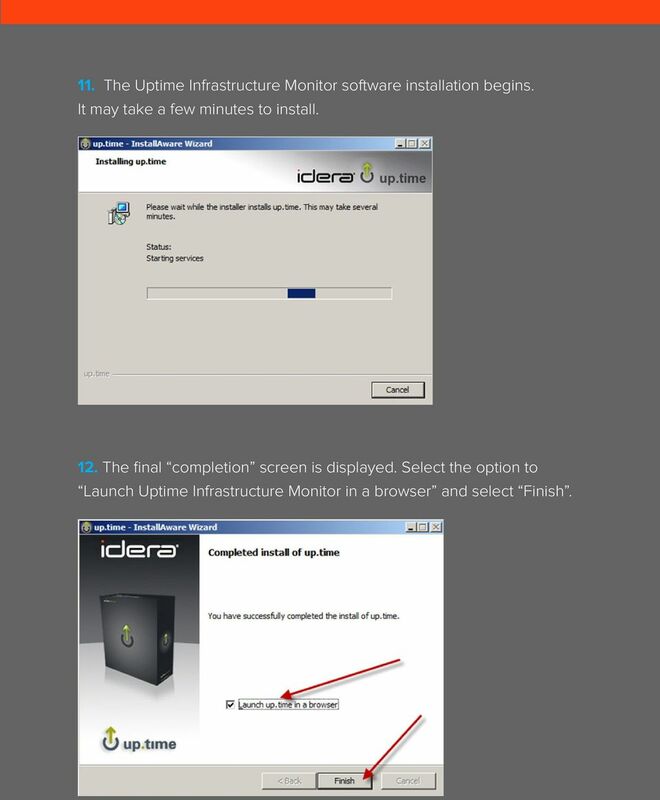 Installation Guide"
2 This guide will walk through each step of installation for Uptime Infrastructure Monitor software on a Windows server. 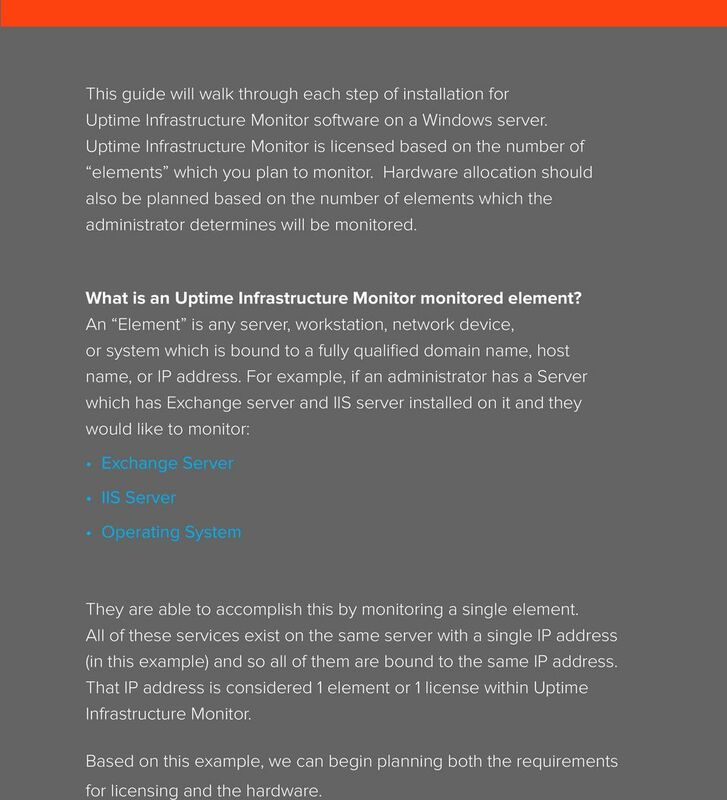 Uptime Infrastructure Monitor is licensed based on the number of elements which you plan to monitor. Hardware allocation should also be planned based on the number of elements which the administrator determines will be monitored. What is an Uptime Infrastructure Monitor monitored element? An Element is any server, workstation, network device, or system which is bound to a fully qualified domain name, host name, or IP address. For example, if an administrator has a Server which has Exchange server and IIS server installed on it and they would like to monitor: Exchange Server IIS Server Operating System They are able to accomplish this by monitoring a single element. All of these services exist on the same server with a single IP address (in this example) and so all of them are bound to the same IP address. That IP address is considered 1 element or 1 license within Uptime Infrastructure Monitor. Based on this example, we can begin planning both the requirements for licensing and the hardware. 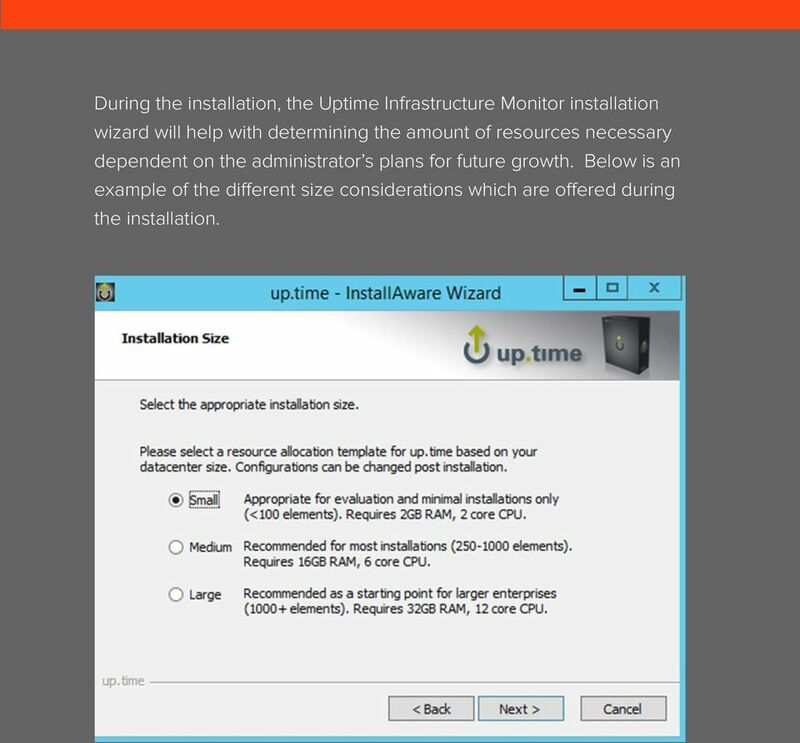 4 During the installation, the Uptime Infrastructure Monitor installation wizard will help with determining the amount of resources necessary dependent on the administrator s plans for future growth. Below is an example of the different size considerations which are offered during the installation. 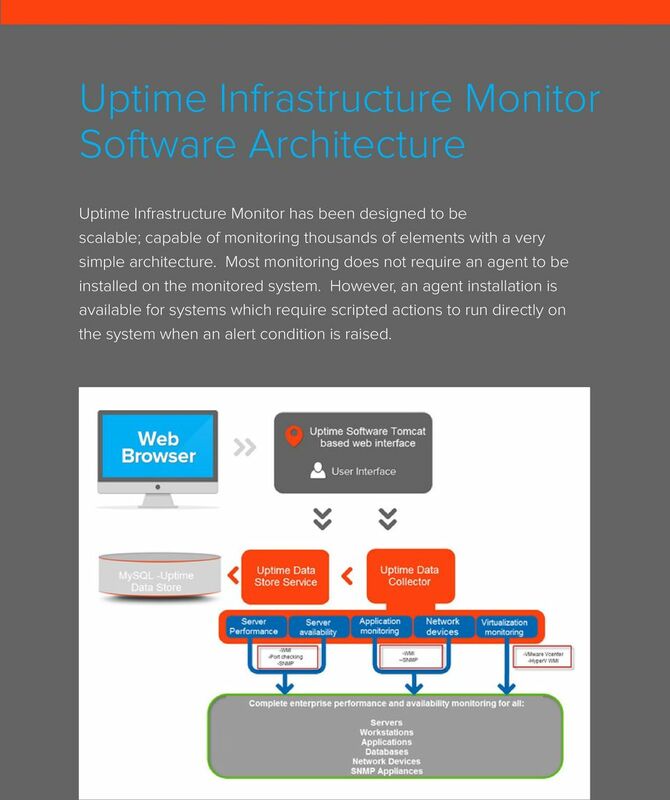 5 Uptime Infrastructure Monitor Software Architecture Uptime Infrastructure Monitor has been designed to be scalable; capable of monitoring thousands of elements with a very simple architecture. Most monitoring does not require an agent to be installed on the monitored system. However, an agent installation is available for systems which require scripted actions to run directly on the system when an alert condition is raised. 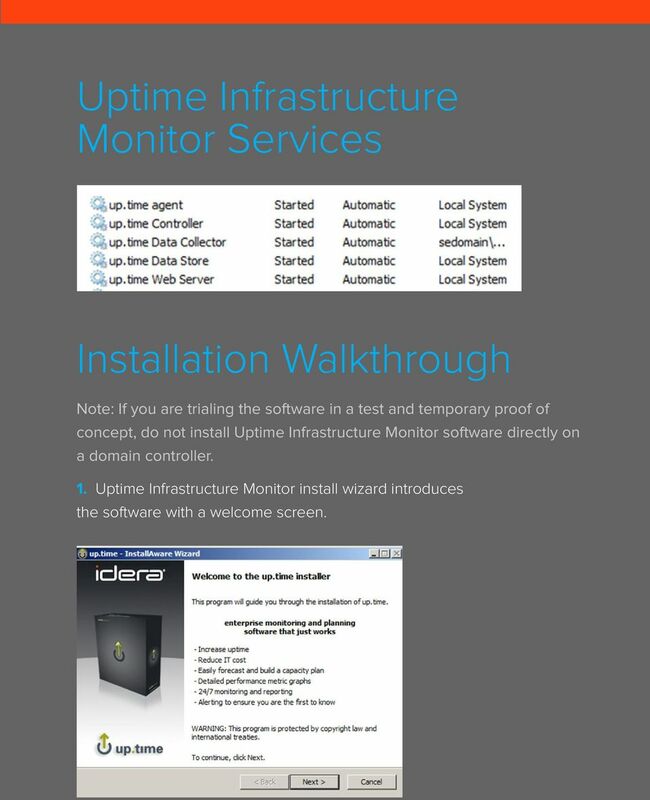 6 Uptime Infrastructure Monitor Services Installation Walkthrough Note: If you are trialing the software in a test and temporary proof of concept, do not install Uptime Infrastructure Monitor software directly on a domain controller. 1. 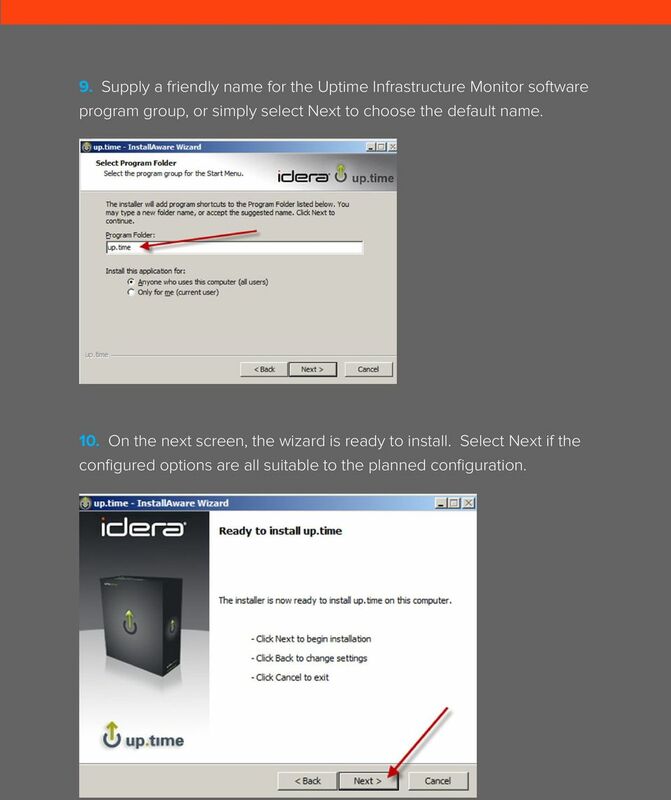 Uptime Infrastructure Monitor install wizard introduces the software with a welcome screen. 7 2. 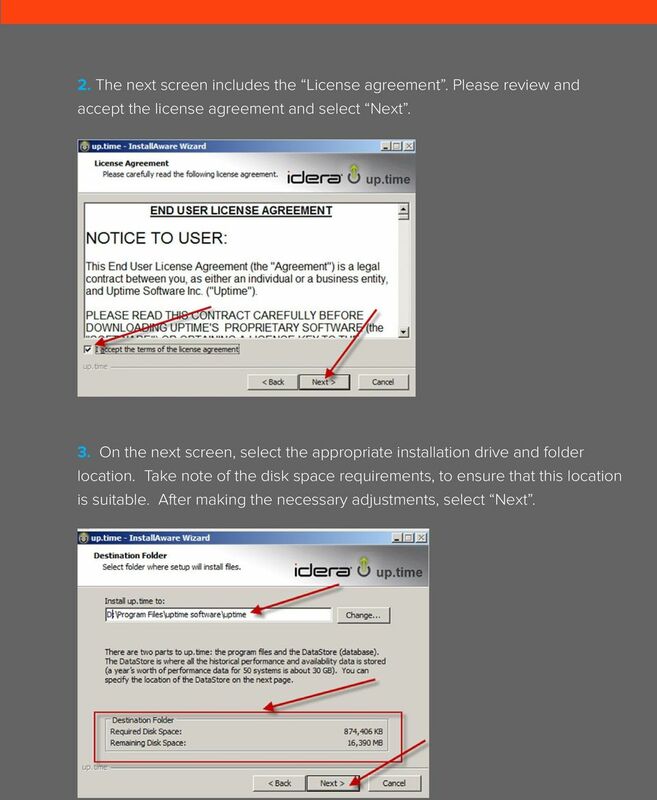 The next screen includes the License agreement. Please review and accept the license agreement and select Next. 3. On the next screen, select the appropriate installation drive and folder location. Take note of the disk space requirements, to ensure that this location is suitable. After making the necessary adjustments, select Next. 8 4. Next select the appropriate environment size based on the previous planning estimates. 5. 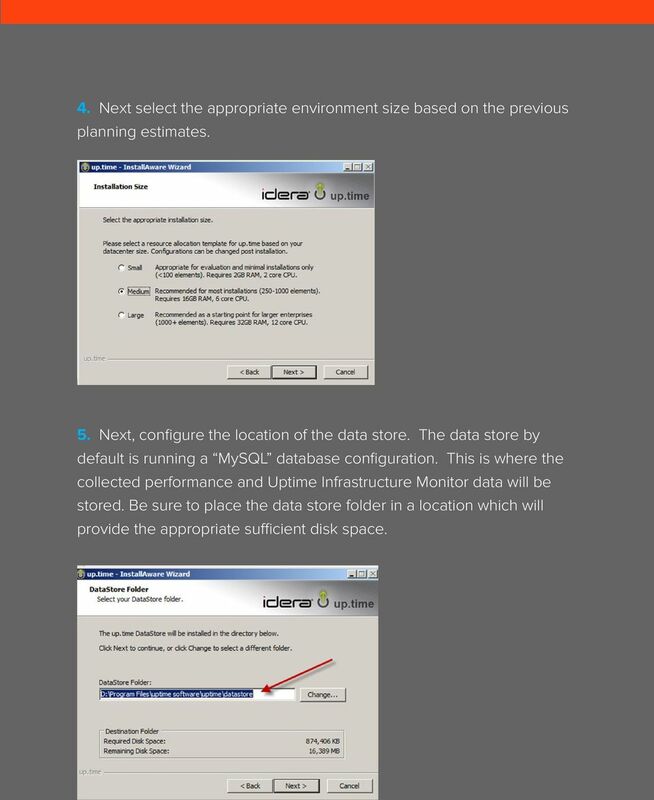 Next, configure the location of the data store. The data store by default is running a MySQL database configuration. This is where the collected performance and Uptime Infrastructure Monitor data will be stored. Be sure to place the data store folder in a location which will provide the appropriate sufficient disk space. 9 6. 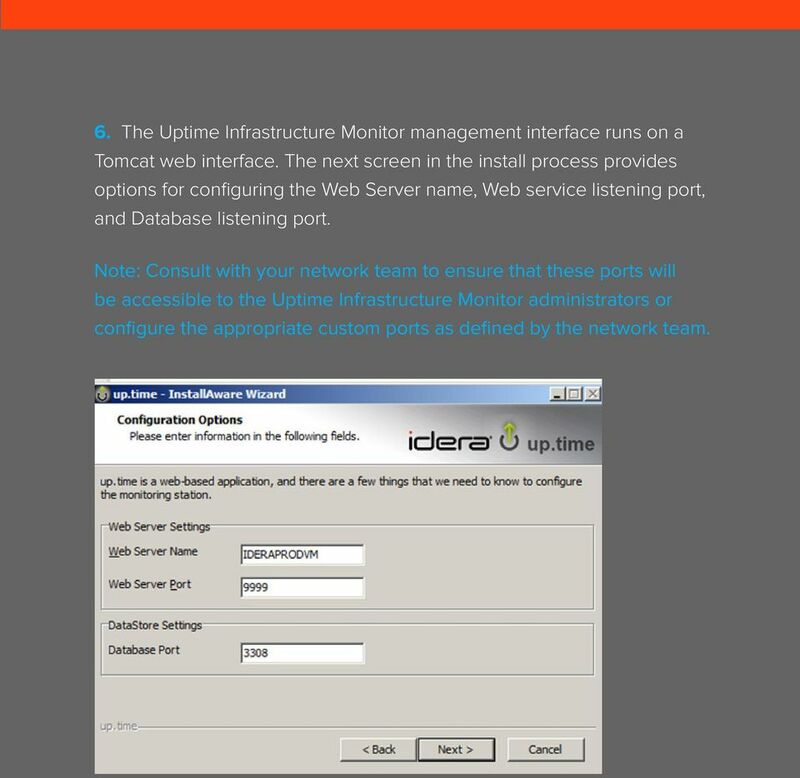 The Uptime Infrastructure Monitor management interface runs on a Tomcat web interface. The next screen in the install process provides options for configuring the Web Server name, Web service listening port, and Database listening port. Note: Consult with your network team to ensure that these ports will be accessible to the Uptime Infrastructure Monitor administrators or configure the appropriate custom ports as defined by the network team. 10 7. The Uptime Infrastructure Monitor install wizard will validate the ports to ensure that they are not already in use. 8. 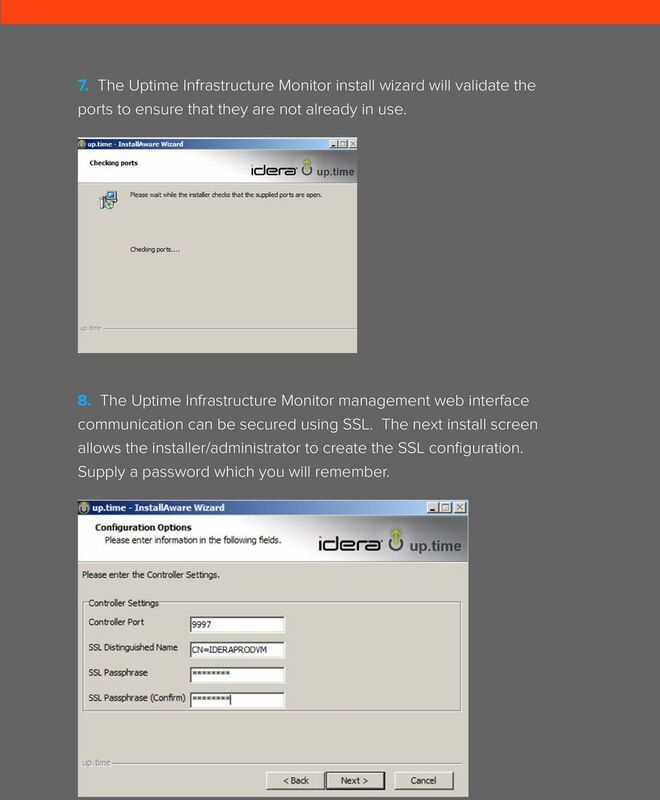 The Uptime Infrastructure Monitor management web interface communication can be secured using SSL. The next install screen allows the installer/administrator to create the SSL configuration. Supply a password which you will remember. 11 9. Supply a friendly name for the Uptime Infrastructure Monitor software program group, or simply select Next to choose the default name. 10. On the next screen, the wizard is ready to install. Select Next if the configured options are all suitable to the planned configuration. 12 11. The Uptime Infrastructure Monitor software installation begins. It may take a few minutes to install. 12. The final completion screen is displayed. Select the option to Launch Uptime Infrastructure Monitor in a browser and select Finish. 14 2. 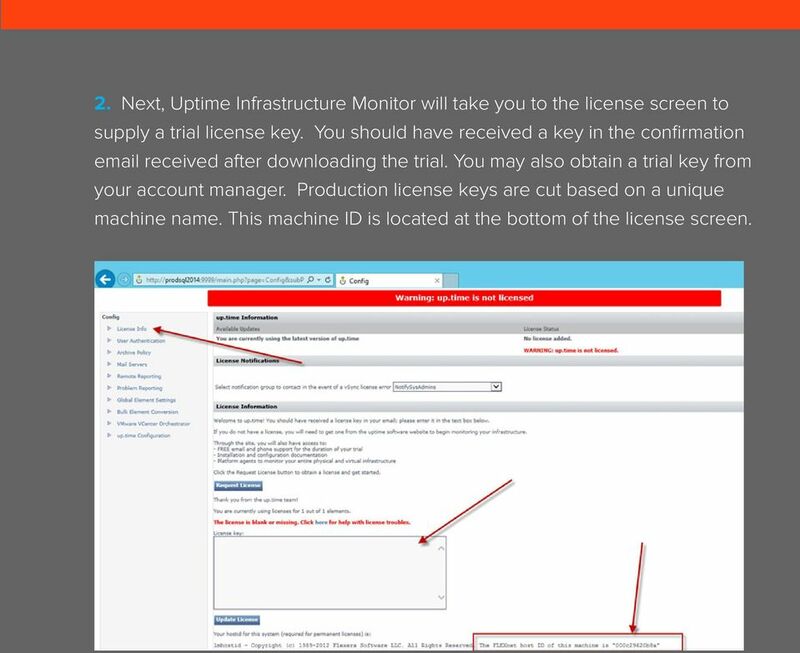 Next, Uptime Infrastructure Monitor will take you to the license screen to supply a trial license key. You should have received a key in the confirmation received after downloading the trial. 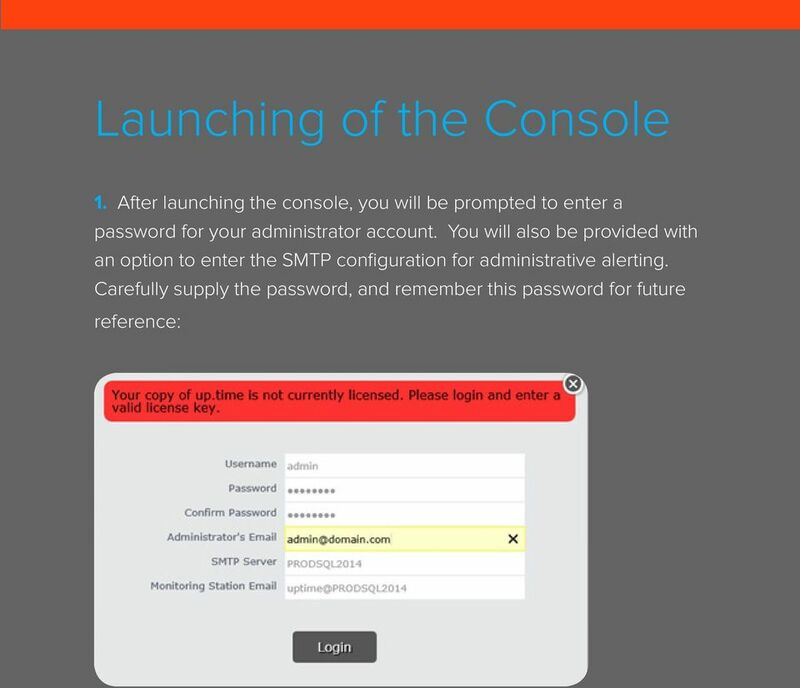 You may also obtain a trial key from your account manager. Production license keys are cut based on a unique machine name. This machine ID is located at the bottom of the license screen. 15 3. 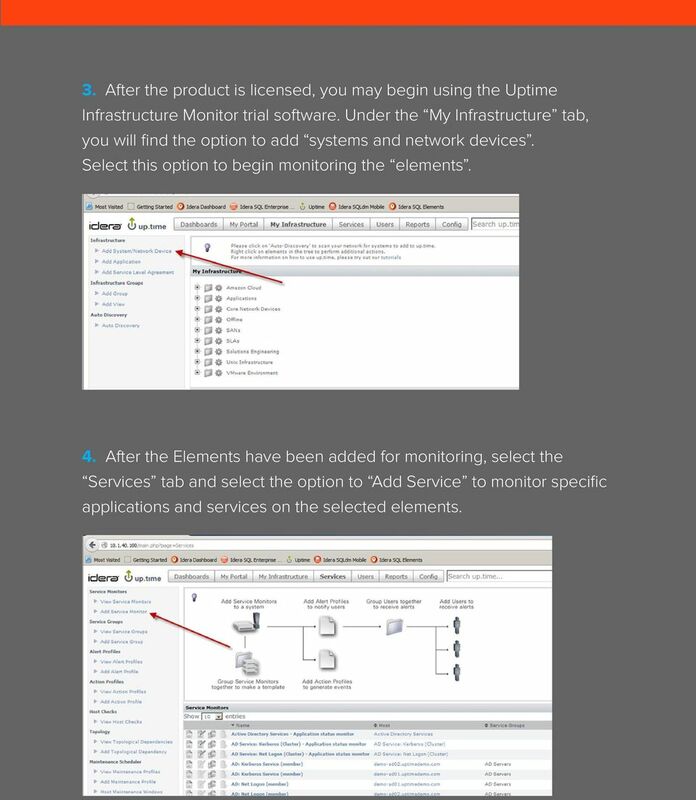 After the product is licensed, you may begin using the Uptime Infrastructure Monitor trial software. Under the My Infrastructure tab, you will find the option to add systems and network devices. Select this option to begin monitoring the elements. 4. After the Elements have been added for monitoring, select the Services tab and select the option to Add Service to monitor specific applications and services on the selected elements. 16 5. 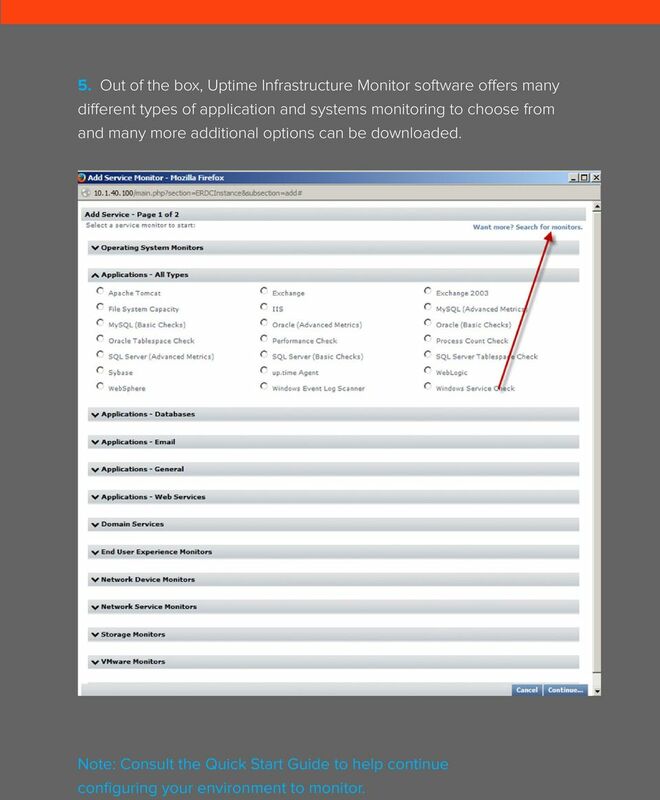 Out of the box, Uptime Infrastructure Monitor software offers many different types of application and systems monitoring to choose from and many more additional options can be downloaded. 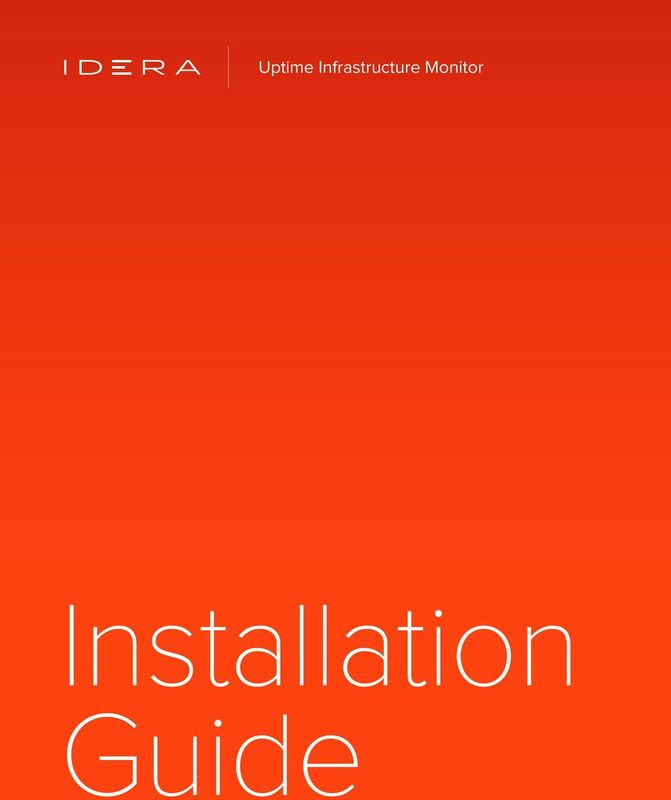 Note: Consult the Quick Start Guide to help continue configuring your environment to monitor. ZyWALL OTPv2 Support Notes Revision 1.00 September, 2010 Written by CSO Table of Contents 1. Introduction... 3 2. Server Installation... 7 2.1 Pre-requisites... 7 2.2 Installations walk through... 7 3.